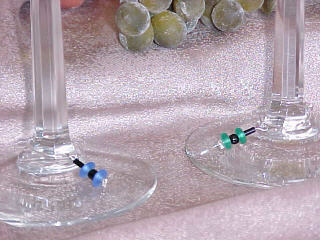 At Wine D. Zine you will find hand-crafted wine accessories. WINE ID--A fun and easy way to identify your wine glass. Four different styles available. WINE BAG--Don't wrap it, BAG IT, in one of our convenient wine bags. **You will receive a complimentary gift card with each item purchased. SPECIAL OFFERS--Be sure to check out our special offers section for great deals. Please continue to check back with our site as we will continue to offer new products and styles. Make a toast, have a blast. Just don't forget to mark your glass! Please see our Wine ID page to see the different styles available.